My granddaughter told me this morning that her doll is zero. She is referring to its age of course. Zero. Poor dolly; so young she doesn't even register on the Richter Scale of aging. I was zero once too. And then I was one. Oh happy day. Then I was big enough to ride the wonderful galloping horse that was pastured in my grandparents living room. 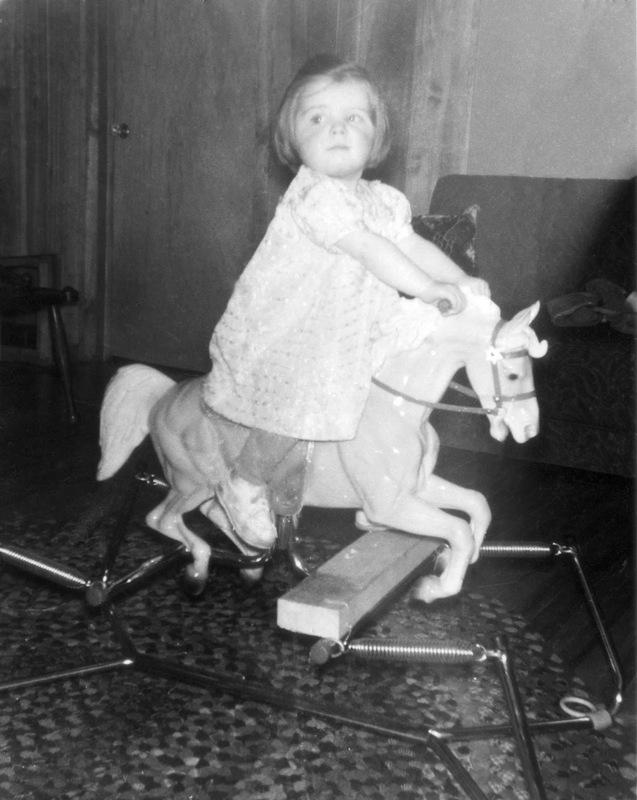 It was an amazing contraption and took up nearly as much space as a real pony. I think it really belonged to my cousin who lived downstairs in a compact suite. Too compact, and so the marvelous steed was stabled upstairs. It looks like my grampa made a small modification to the joy ride. A pretty stout two by four allows equestrian spirited toddlers to mount and dismount all by themselves. It is good to fan the flames of independence. This is one of my favourite photos of myself. And I remember the wool rug with kaleidoscope flecks of color. And I can even remember glancing over my shoulder warily as I rode grimly onward. It was because of the cuckoo clock high on the wall. I was scared of the little bird that lived inside. But still I rode ever onward into two and three and four and beyond.